I haven’t shared a food recipe with you guys in a while, so this week you are getting one of my favorites. Today’s experiment: Homemade Chicken Broth. My husband and I are vegetarians (thought not strict at all! ), so we haven’t had any chicken broth, or any chicken, for a while. Lately, I’ve been wanting to incorporate a little meat pack into our diet so see what kind of effect it would have on us, if any. What better way than to buy a whole chicken and use the bones to make broth? Now this broth recipe is totally no frills. There are many other broth recipes out there that suggest using eggshells or fish bones instead of chicken bones. If this recipe doesn’t satisfy you, just know there are other options out there. Defrost and prepare chicken as per instructions on the package. Throw your chicken into a 6-qt crock pot. Season at this time if you desire. Salt, pepper, garlic, and onions are great. Toss in your veggie scraps. During the week before I cook the chicken, I keep the scraps in a freezer bag in the freezer. My scraps normally consist of carrot peelings, potato peelings, ends of zucchini and onions, and spare pieces of peppers. Add your seasoning. My favorite are whole garlic cloves (you don’t even need to peel them!) and a Mrs. Dash-like blend of savory spices. Add the vinegar. This will help leech the nummy, nummy minerals and vitamins from the bones and vegetables. Let the mixture sit for one hour while the vinegar is doing the leeching. Cook the mixture on low for 8-12 hours. You can go longer if you want. Let the mixture cool down. Skim off the fat, remove the bones with a slotted spoon and discard. Divide the broth into bags or containers by two cups (or the average amount that you use for recipe). Freeze any broth that you aren’t going to use within a week. This broth is so delicious, much better than store bought broth. Also, it is nutritious! And, of course, it’s cheap! This recipe makes about 20 cups of broth. 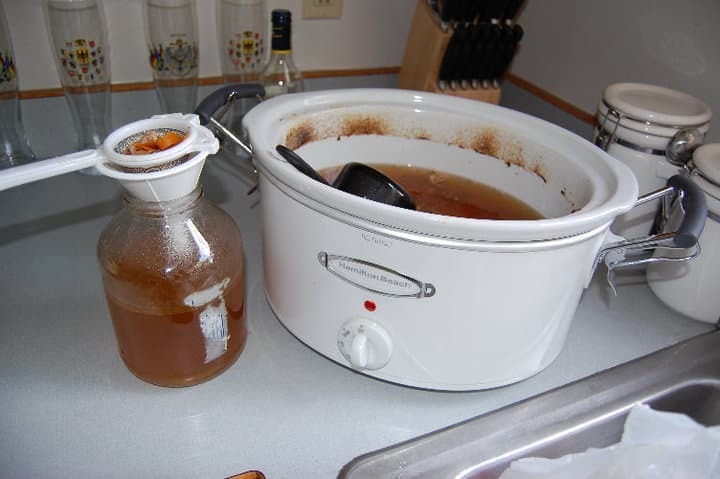 What do you think about making your own broth? Anyone out there have any tips for us? ok…. WOW. this sounds like a LOT of prep time for chicken broth! 5-6 hours with chicken meat, then another 8-12 hours with bones??????????????? If you start at 6am, you MAY be done at 7pm…. if you do the short times!!!! Yes, it is a lot of time, but you aren’t really doing anything. I”d say that the total active prep (prepping the chicken, then deboning it, etc.) is probably around 20 minutes altogether. I always do it in the middle of the day and let the broth cook on low overnight. I love to make my own home-aide chicken noodle soup, chicken pot pie, potato soup, etc. Whenever I make anything that starts with a rue base like the above I then make it into my own broth, whether milky or water based, depending on the meal. I prefer my own broth because I think it is more rich & has more depth than the store brand although it may be too much for others. After years of watching my grandmother & then testing on my own I have found that by using the ready made chicken or beef boullion cubes or powder melted in butter. Place in carrots, celery onions & whatever else desired, but those are the root vegetables. Once softened then add 2-3 tsps of flour to thicken rue base. Once the flour mix “balls up” slowly add in approximately 1 cup or more of milk or water while over heat whisking gently but continuously. At this point while it is the consistancy you desire add in the meat of choice, chicken, beef, pork, etc on the bone and cook until it literally falls off the bone if desired. If I am making chicken pot pie or chicken noodle soup or whatever I put my chicken pieces in the pot with my vegetables. It offers the taste of cooking for a long time while not taking a long time. So? Has it affected you? Actually, it gave me a ton of energy that I had lost, so eat meat a couple times a week now.